Vasily Yeremenko, a Major General of FIB in reserve, academician of the Academy of Security, Defense and Law Enforcement, was the first to speak to the press. In Soviet times he served in the KGB and supervised the Air Force and development of aviation technology. Among his assignments was collection of information by the Air Force of the facts of appearance of unidentified flying objects. According to Vasily Yeremenko, by that time there was an ample amount of such information.x Missile units were even given a directive in case of detection of UFOs. The main task was not to create opportunities for reciprocal aggression. In 1983-1984 at the testing grounds of the Academy of Sciences by Vladimirovka, the Ministry of Defense and the KGB organized a large-scale study of paranormal phenomena. The military training site was not a random choice. Experts have long come to the conclusion that UFOs inevitably appear in places where military equipment and weapons are tested. First, modern science was not yet able to identify such phenomena. Second, it could be reconnaissance equipment of the U.S. or Japan. Third, it could be an impact of an extraterrestrial civilization. 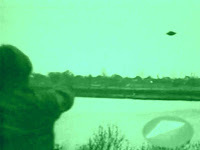 "The UFO topic today is ubiquitous. Precisely because of its scandalous nature serious scientists are not willing to identify their position on this issue. Pilots often see such objects, but they have a veto on this topic, so do astronauts. In confidential conversations they talk about their experiences meeting with UFOs, but they are afraid to speak publicly about this," said Vasily Yeremenko.x He believes that this subject requires a serious approach because it is a security issue. Yet, it is still a closed topic both in the U.S. and in Russia. Lt. Gen. Alexey Savin proceeded to reveal some aspects of the engagement of the Ministry of Defense. He headed the Expert Management Unit of the General Staff, whose task was to examine various unusual phenomena. The main project of the unit was a state program on the discovery of intellectual human resources. The goal of the program was to identify ways to make the human brain work in a special regime of super-powers, making a person a superhuman. The Scientific Council of the program was led by an Academician Natalya Bekhtereva, who until her death served as a scientific director of the Institute of Human Brain of RAS.x Over two hundred highly skilled professionals from across the country participated in the program. "In the process of research, we came to the conclusion that a human was an energy and information system that receives information from outside. This is precisely why a human can manifest paranormal abilities," said Alexey Savin. In order to identify this external source of information, three groups were created. One group was formed from scientists, another - from military, and the third one was composed of women. Damnit. I wish this was More forth coming. I would love a name of one of the women, some discussion of How or what method was used to stream line thier brain waves to the communication frequency. There simply HAS to me a methodology for contact which any one can adopt. Its in our DNA and our soul. Meditation is the starting point Im sure. Must be a paper written some where damnit. A testimony or instructional on the internet that most people overlook because they think its crazy or a hoax. This very topic is the culmination of Every thing Ive researched for.